In India, wherever two Englishmen meet, complaints about the "fiendish ingratitude of the black devils" are soon heard and wherever two natives encounter each other, complaints about the "dark intentions of the white oppressors" will pour forth..... Taken together, these complaints produce the same effect on the listener as the duet of "the two blind men" in the operetta bearing that title. In deceiving England concerning India, unconsciously it may be, these oppressors deceive themselves. They treat the natives like slaves or chained dogs; and the slave takes refuge in a slave's only weapons - lies and cunning; and the dog will sink its teeth into its master's neck if it ever breaks loose from the chain. Under this destructive influence all the noble virtues of this people, sentiments of honor, of duty to one's neighbor, of gratitude, all these die out, and are superceded by either negative qualities, complete apathy, or the lowest forms of vice. Thirty years ago you could go to the nearest money-changer (who is likewise a banker), sitting on the street in his hut, and safely leave your entire capital with him, without even taking a receipt; you could then go away, and returning in a year or two, lay your claim before him. And at your first word the banker-money-changer would return the money, even though it were a million. 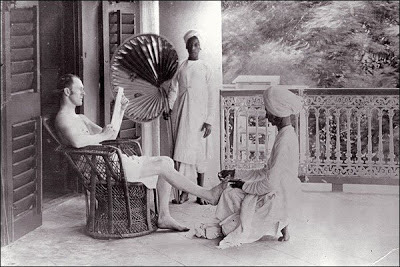 ( *This was told me with regret by several Anglo-Indians who had lived in the country all their lives, and by Mr. H--- among others, a wealthy Englishman who for forty years had held some of the most important administrative positions in the country.) In those blessed days a Hindu's word was sacred, and he was expelled from his caste for the least dishonest action.... Until the upheaval of 1857, receipts were practically unknown in India: one witness was sufficient for any kind of transaction. And now? Now mercenary witnesses have multiplied not by hundreds but by thousands. A Hindu will out-cheat ten gypsies. In the good old days, in allowing the native to hold a cow's tail in his hand and take his oath on it, the judge could guarantee with his life that the Hindu would never bear false witness on the sacred tail; nowadays, according to the new juridical procedure, they are all, without exception, forced to give their oath on the Bhagavad Gita (a scripture about Krishna), even when the witness does not believe in Krishna but worships Siva or Vishnu. "The cow's tail," don't you see "shocked too greatly the inborn aesthetic sentiments of the British" - is the English explanation of this juridical change. But was it not from an overdone intent to reward India in an artistic and aesthetic manner that she was shamed in an economic and moral sense? Judge for yourselves. Having, for instance, embellished the country with gorgeous public buildings, mostly prison-castles and barracks, they permitted a memorial such as the two-thousand-year-old Sarnath, erected before the time of Alexander of Macedonia, to decay and fall apart as it pleased. Having directed their constructive energies towards the building of universities, town halls, clubs, Masonic lodges (in European style), and having driven the natives out from these, except the first-named, they compensated the latter by giving them complete control over all the public-houses which they, the English, had built with the purpose of selling the adulterated alcohol of their own country, including that intoxicant known as Scotch whisky. The attitude of the English as regards the natives of the better and more highly educated class, coldly-contemptuous and crushing as it is, is in this instance a much more serious thing, all the more so since the cultured natives are not used to this, and it did not exist at the time of the East India Company. Listen to what The Statesman, the most frank of the London journals, says about the feelings of the Hindus towards their rulers: "It is not India's financial status that causes us the greatest uneasiness, [says this paper] but the state to which the bulk of the population has been brought through our administration and through our unquestionably despicable conduct with regard to the native rulers. We are detested alike by the classes which were powerful and influential before our time, and by the students of our own educational institutions in India, the schools and colleges; we are detested because we egotistically deprive them completely of all honorable or profitable position in the management of their own country; we are detested by the masses for all the indescribable suffering and for that fearful poverty into which our rule has plunged them; finally we are detested by the native princes for the tyranny and oppression the Simla Foreign Office has practiced upon them." These words were reprinted in all the native newspapers and journals without comment. I do not know whether England gained by the change; it would be out of place to go into this question now, but if the unanimous testimony of the natives as well as the admission of many Englishmen are to be credited, India lost a great deal. What did it matter to the Hindus that the unscrupulous activities of such adventurers as Warren Hastings and company became henceforth impossible in India? For people with such original opinions built up through the ages, as the Hindus and, generally speaking all Asiatics have, regarding any voluntary mutual agreement, an administrator in the Oriental style such as Hastings, who was ready to look with favor on any kind of offering, ranging from an entire province down to "Borzoi pups," in the style of Gogol, [Nikolay Vassilyevich Gogol (1809-52), Russian novelist, playwright and humorist. - Translator.] was far more acceptable than an administrator of the Beaconsfieldian drawing-room lap-dog variety. It was possible to come to an agreement and to enter into personal relationships with the former, and, while losing on one hand, to win on the other; but the latter, appearing like some kind of unapproachable luminary, bureaucrat and formalist, looks on the native as vermin which must not be touched even with gloved hands, but only ruled over, with its tail firmly crushed under one's heel. As a result of the Mutiny and with the new order brought into the country, the Hindu without a doubt became more civilized. Together with the above mentioned charming European aesthetics, he learnt much that he had not known in the days of the Company, as for instance that Themis may be just as blind in civilized as in uncivilized countries, yet, to make up for this, she must also remain incorruptible; but he gained this knowledge theoretically only, without, of course, having any faith in the principle itself, and in practice often trusting to the reverse. From his masters he learned the refined ideas on civic virtue in general, and the honor of a gentleman in particular, while he himself, under the constant pounding of the heavy waves of English contempt, lost even the last conception of his own honor, as well as all feeling of self-respect. It follows, then, that the British government, with the best of intentions, is ruining India. As far as I can see, this is a situation that cannot be remedied though England should correct all the mistakes of the last twenty years, especially those of the administration of Disraeli. But even so, she is incapable of either remedying the damaged morality of the country or of changing the nature of the English, who have cut a deep rut for themselves as a result of their contempt for everything native, and who have on their own side dug such strong albeit artificial dikes that they will never in a thousand years reach an understanding with the Indians.